Rosa Snyder is a senior paralegal at Lanny D. Ray, Attorney at Law, PLLC with 9 years of experience. 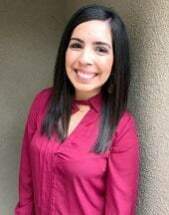 Rosa is fluent in Spanish and she provides support in all aspects of the litigation process including assisting in client meetings, drafting pleadings, and gathering and preparing documents to be used during the discovery process and in court. Rosa attended Sam Houston State University and graduated with a B.A. in Victim Studies and a minor in Spanish in 2009. Rosa’s experience includes, but is not limited to, the following areas of law: civil litigation, personal injury/wrongful death, real estate litigation, and probate litigation/estate planning. On a personal note and outside of legal work, Rosa enjoys spending time with her family and friends, fishing, and making frequent visits to her parents’ ranch.